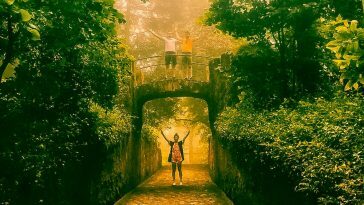 Get active and explore Catalunya - Go for it! 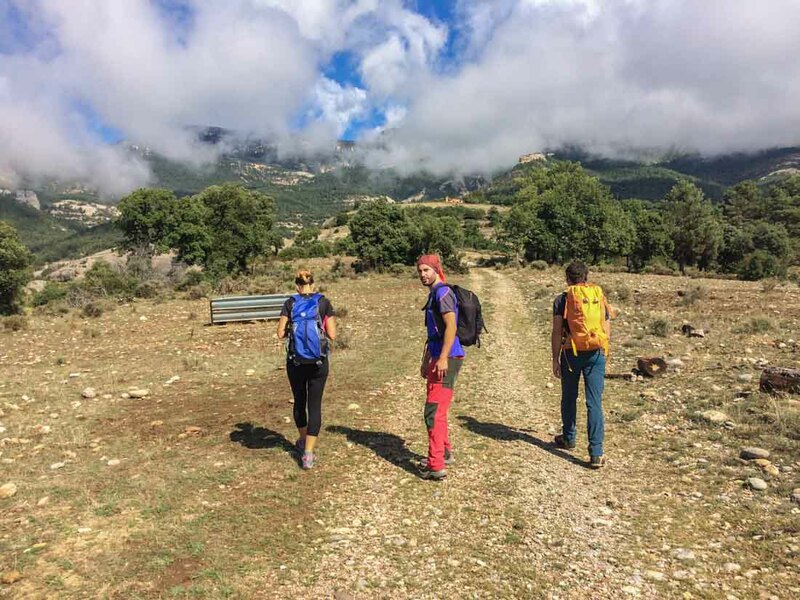 Get Active and Explore Catalunya – Go for it! Déu n’hi do! Wow in Catalan. 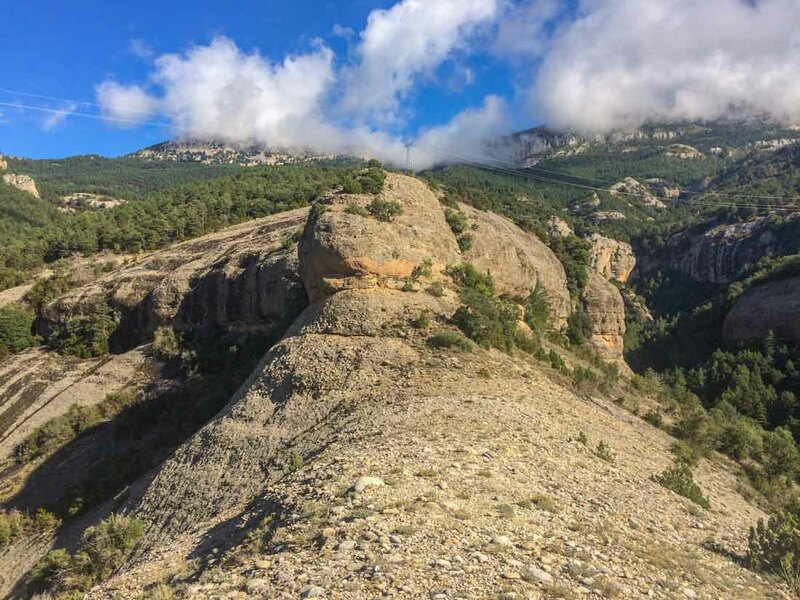 It’s a word I used a lot on a recent trip to Catalunya when experiencing what the great outdoors there has to offer, and if active holidays are your thing then then this is a place for you. I was based in and around the districts of Solsonès and Alt Urgell in Lleida. An area of rolling hills, castles, historic towns, and to the north the magnificent Catalan Pyrenees tempt you to explore them. 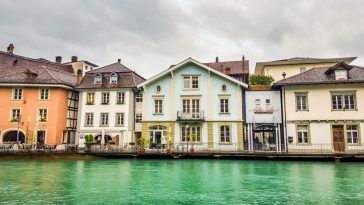 This is a great area to visit if you love the countryside, nature, mountains, and activity holidays, and luckily for me, these are all of my favourite things. I love Catalunya and I’ve been coming here for years but have rarely ventured away from Barcelona and the coast, so exploring this area was new to me, as were some of the activities that I tried but more on this later. I travelled courtesy of the Catalan Tourist Board and their website, plus the regional tourism office websites for Solsonès or Ara Lleida are good starting points for researching holidays to this area. 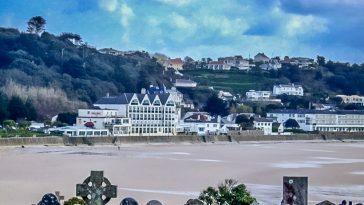 When you are there the staff in the tourist offices will be happy to provide you with plenty of information on activities and walks in the area. So lets warm up with a gentle walk shall we. 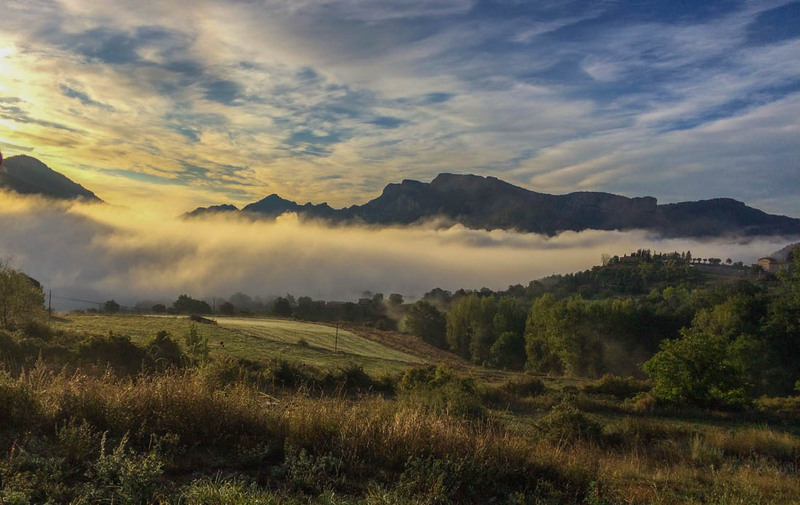 There are 9000km of paths and 18 natural parks in Catalunya, including one national park – the spectacular Aigüestortes i Estany de Sant Maurici, so there is plenty to go at and enough variation to suit all levels. We walked around the mountains near Cambrils dels Pirineus on a beautiful sunny morning. I’ve written this before but one of the joys of walking in this part of the world is that you are significantly more likely to be walking with sun on your back – something which is not guaranteed on my walking holidays in the UK! Our walk took us through forests, by rivers and up and over rolling hills in the foothills of the pyrenees. As we looked up to the sky it wasn’t long before the first vulture came into sight; egyptian and black vultures are common here, and if you are lucky the magnificent bearded vulture – the quebrantahuesos – can be spotted in Catalunya too. What struck me most about this walk was the aromatics that acted as a guard of honour as we strolled in the morning sun; the smell of wild rosemary, thyme, lavender, and oregano was everywhere as we ambled through the Catalan countryside. The walk was spiced up with a little via ferrata. For those uninitiated, via ferrata is the system of iron cables and climbing aids that are most famous in the Italian Dolomites but are increasingly popular here and it’s great fun. 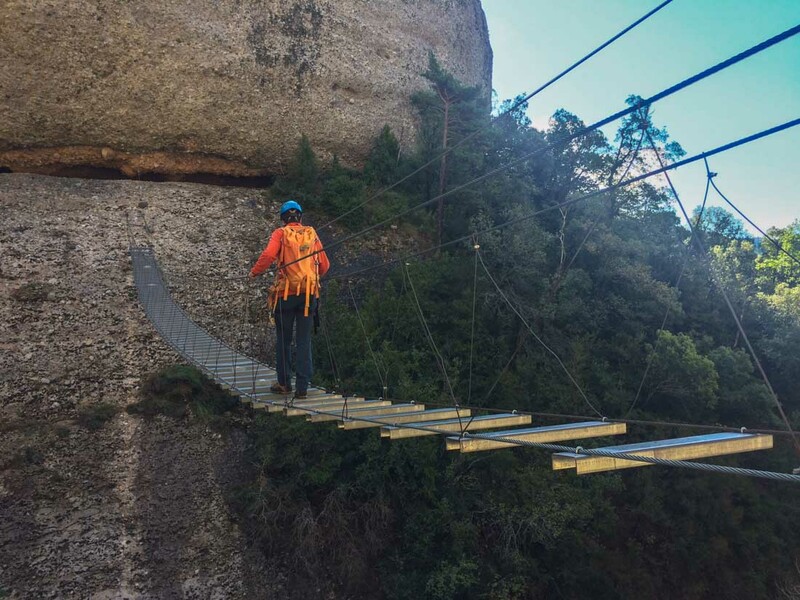 A little bit of exposure and a perilous looking suspension bridge is good for the heart rate but perfectly safe with the right equipment and the reassurance of the Tirantmilles mountain guides that were helping us. 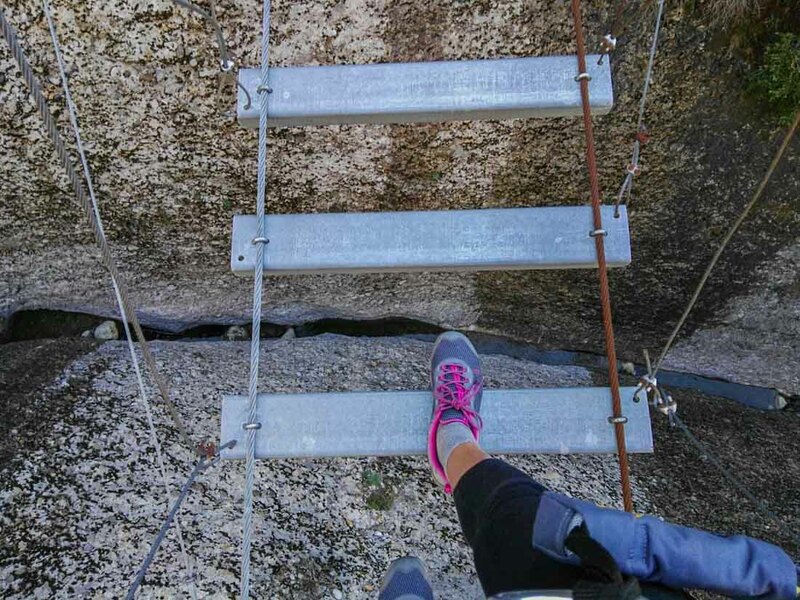 I carefully made my way across the bridge, looking down at the 50 metre drop below me, before reaching the safety of the other side. We continued on our way, stopping to explore a cave used by the Guardia Civil on their training activities but currently only occupied by one small bat. Our final stretch of the walk took us back out in to the open and allowed us to take in the mountain views all around us and enjoy the warmth of the sun. I also noticed the odd casa rural on the landscape too – these are country houses that can be rented in the same way that cottages can in the UK with many catering for large groups. Catalunya makes walking easy. All of the main walks are well signposted and details of the route can usually be found at the start of most of the main routes. As I mentioned earlier the tourism offices are great resources for walkers and you can pick up maps in most towns in the area. We stopped at Sant Llorenç de Morunys which would make perfect base for exploring the area. 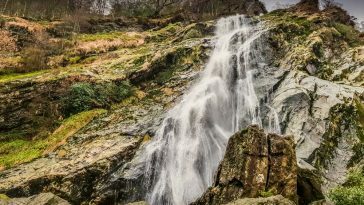 It’s in a beautiful location with mountains all around and there are plenty of walks on the town’s doorstep. Next up, how about a bit of white water rafting? 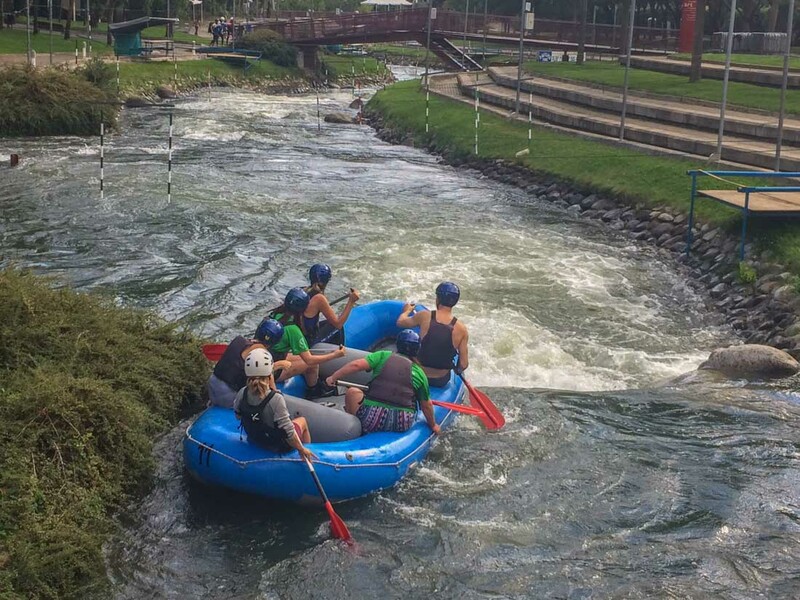 We visited Rafting Parc at La Seu d’Urgell which was used as the open water venue for Barcelona Olympics in 1992. One of the best things about this centre is that it’s a circular route made possible by the mechanical belts that carry the boats from the end of the course back to the start of the route. I loved the white water rafting – it’s an exhilarating experience. Racing down the water, staying in the boat as it drops down the various levels by using the footholds and leaning back, smashing through the rapids, bouncing backwards off the rocks. Great fun! If you’ve never white water rafted before then this is a good place to start, and because it’s in a controlled environment it’s safe too. 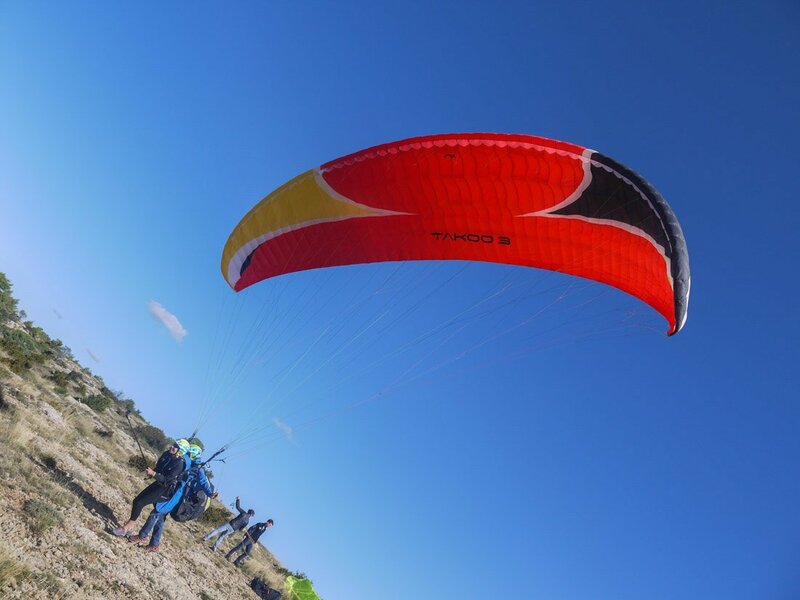 Ever tried paragliding? No? Until this trip then neither had I but it turns out that I love paragliding! There is something unnatural about running off the side of a mountain strapped to another man and a parachute, but once you are up there and gliding about like the vultures that pass by then it’s a serene experience. 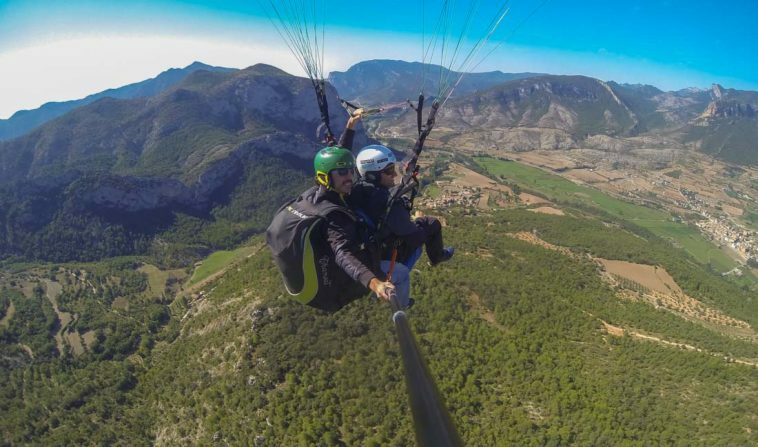 We did this from the town of Organyà which sits in a beautiful valley with hills around that have the right currents for paragliding. The scariest bit was the off road journey up the mountain in the 4 x 4 which had some steep drops below us but we were in safe hands with the staff from Parapent Organyà. The flight lasted around 20 minutes but it seemed like longer. I found it to be a very relaxing experience, there were great views all around and you get to see the world as the vultures do for a small while. To add a little excitement I accepted the offer of an additional acrobatic move; a few gentle rocks from side to start which then turns into a number of spins at nearly 100km an hour with 3Gs of force. Amazing! Finally we came into land and I came back to terra firms with a big smile on my face. 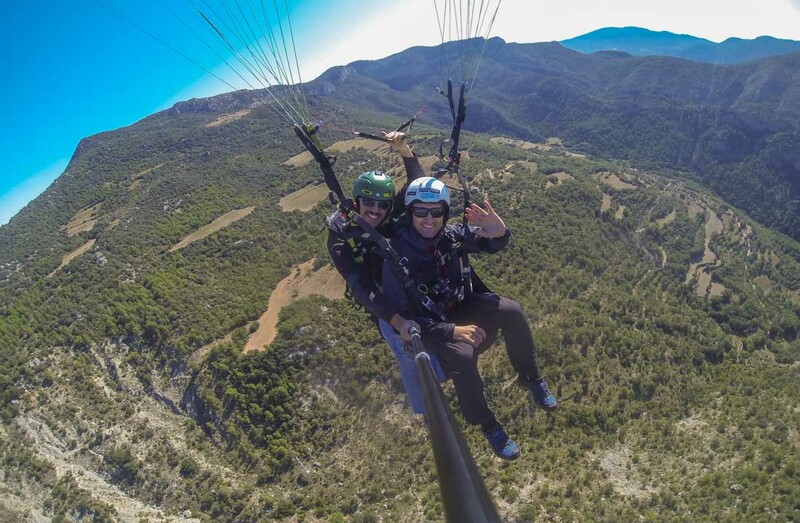 If you haven’t tried paragliding then do it – it’s an fabulous experience. 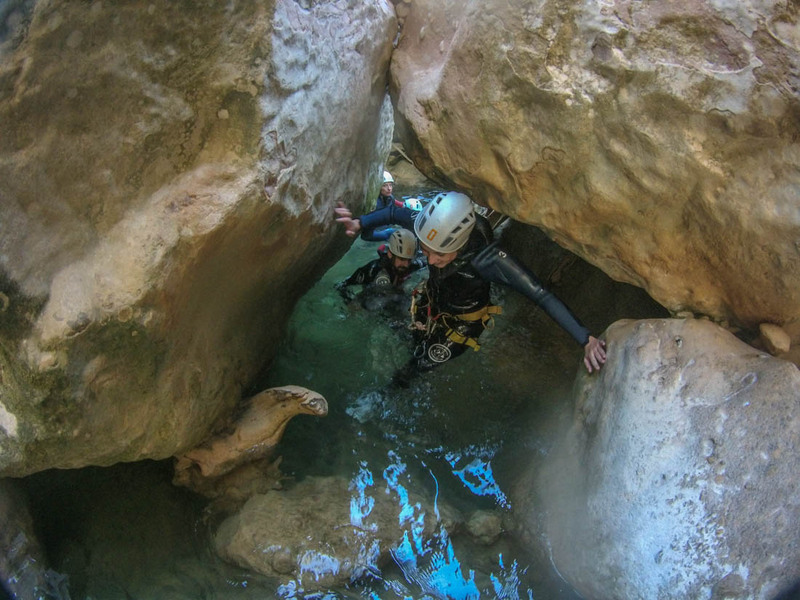 Last but certainly not least was canyoning which we did in the beautiful Vall d’Ora. A lovely spot with forests and imposing cliffs all around. Also housed there is the picturesque church of Sant Pere de Graudescales which is worth seeking out if you are in the area. 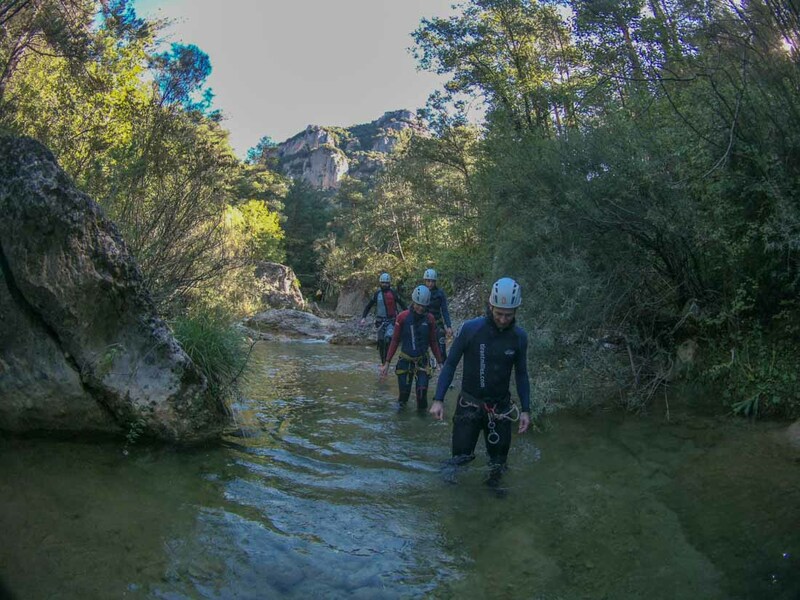 So what do you know about canyoning? Well it’s basically donning a wetsuit and moving down a river or canyon by walking, sliding, down climbing, dropping into pools of water, and a little bit of abseiling. We did a beginners course with our friends from Tirantmilles guides and I must admit I wasn’t sure if spending a morning in a river would be for me but I absolutely loved it. The wetsuits keep you warm and it’s great fun. There were no big drops into pools on this route, it was slides, a few small plunges, and two small abseils but again all of these were controlled by our guide Marcel. Siding down the odd torrent, and bobbing from pool to pool I really enjoyed my first experience of canyoning. 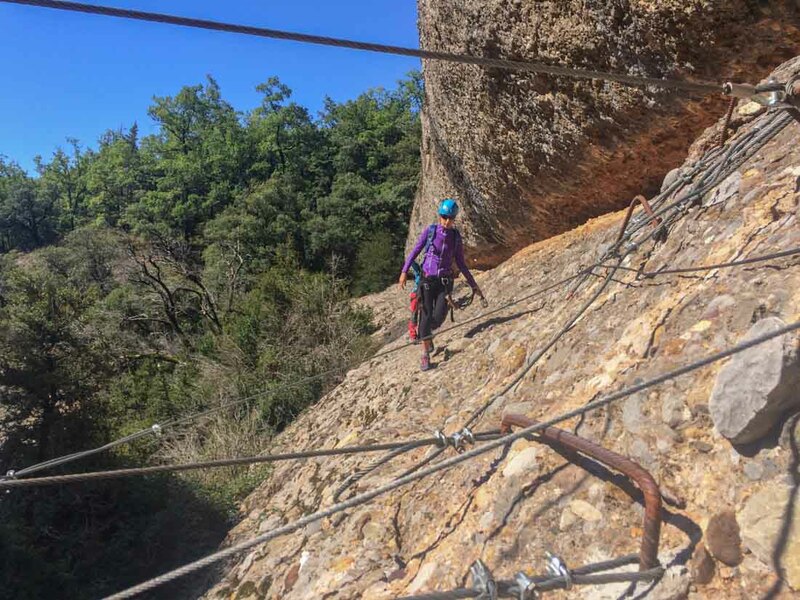 If you’ve never considered it then then give it a go – and Catalunya has loads of canyons and companies offering guided tours for beginners. Kids would love this too. As ever, travelling tends to be as much about the people you meet as the experiences you have and I must say that all of the hospitality I received in this part of Catalunya made me feel very welcome. The people were warm and friendly and it almost goes without saying that the food and wine were delicious! The people are very proud of their area and rightly so, it’s a beautiful place. There was one more Catalan phrase that I picked up; fot-li canya! Go for it! If you’ve never thought about doing some of these activities before then go for it. They are fabulous experiences and where better to do them than in Catalunya.